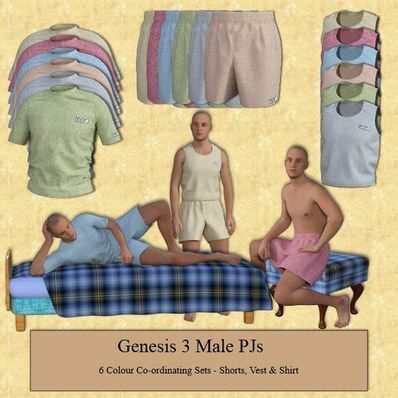 PJs for Genesis 3 Male for use in Daz Studio 4.8. Shorts, Shirt & Vest. I have also included 6 co-ordinating Textures. Good to see these for G3M as the guys tend to get overlooked. Thank you so much for sharing your creations!!! Lovely. The male figures often lack clothing compared to the females. Thank you very much for this wonderful set! Merry Christmas! Thanks for the PJs great work as always ! " A Very Merry Happy Christmas." You are too generous... not that I'm complaining. Thank you very much. Merry Christmas! These are very nice and lots of color options, thanks! thank you for your clothing. Merry Christmas. Merry Christmas! Love the wrinkles... I'm am in awe of your clothing :) Thanks for sharing! Thank you so much for these wonderful freebies. I wish you merry christmas. Thanks a lot,very nice, have a good chrismas time. Big Thanks and Merry Christmas!!! Wendy, these PJ's are awesome! They look so natural! Love the wrinkles and the various textures. You're the BEST! Merry Christmas and Happy New Year! Thank you for a very useful item. Happy Holidays! You make some amazing products. Thank you for your generosity. Thanks Wendy for creating such wonderful and practical clothing. Best Wishes for the Holiday Season. Thank you. These could easily pass as PT gear for WW2 soldiers. Thank you these look great - love the wrinkles. Looks great, as always :) Thank you very much.